As I was putting away books I had gotten out a while ago, I took another look at some of the pages I had marked in Deborah Schenck’s Fern House. This is my take on her photos of flowers laying on open books. 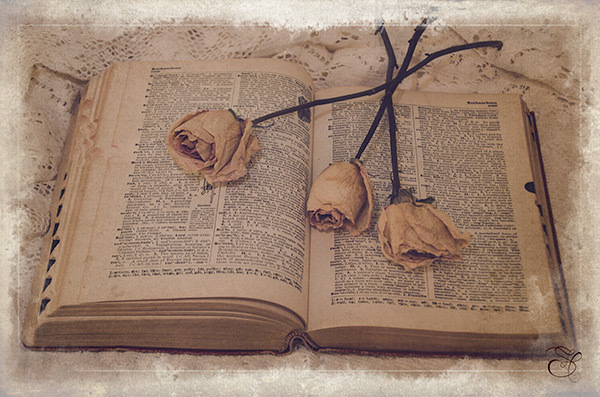 I used some dried roses from the summer and a vintage dictionary. The lace is from a runner that belonged to my husband’s grandparents; made for a nice vintage touch to the background. This shot was taken indoors; I used a gold reflector to the side and had a diffuser on my external flash that I aimed at the reflector. I used a kk_daysofold Lightroom preset; added a kk_canvasgrunge texture, and a Photoshop Artistry Grunge Edge Effect.